Did you know that your refrigerator is home to a lot of bacteria, fungi and mould that you cannot see? Well, this is something that many people ignore while thinking that their fridge is squeaky clean especially when they are aware of the fact that there is nothing rotting inside it. With DIY tricks of keeping a cut lemon in the fridge to remove odour is effective to a certain extent but not always do the contaminants get attacked. To prevent problems such as food rotting or probably contamination of cooked food, there is the need for you to clean the fridge occasionally. That would not just increase the longevity of the fridge by taking away excessive load from the compressor while keeping your foods fresh. Here are a few steps that would ensure that you have a clean fridge with no possible elements harming your food. There are times when you may have perishable foods such as raw meat, fish, frozen vegetables etc. that is likely to deteriorate in quality when left at room temperature. Cleaning the fridge while of these are still there may end up making you throw them away in the bin as it wouldn’t be edible later. 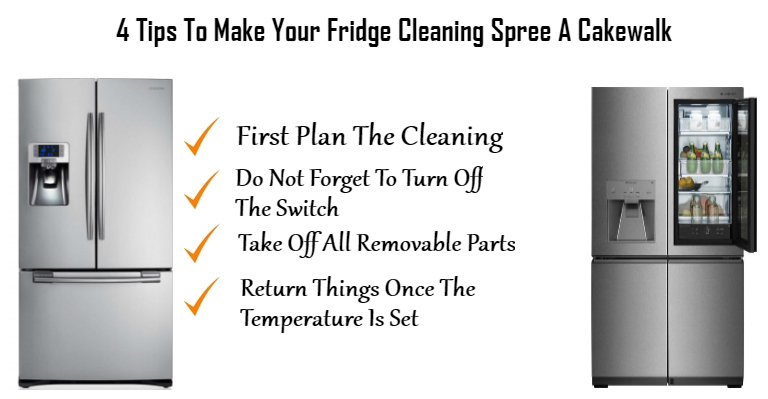 Therefore, experts for fridge repairs in Ultimo suggest planning the cleaning accordingly where all you are to do is ensure that you have consumed all such foods and haven’t replaced them again until the fridge is cleaned. This allows you to save money as well. Even though cleaning the refrigerator with the switch on wouldn’t give you chocks, but that would have an adverse effect on the electricity bills as well as the compressor where it would be trying hard to adjust to the outdoor temperature. The professionals for fridge repairs in Darlinghurst agree that there are chances of being harmed when cleaning the outsides and so switching it off completely is a better option. While you switch off the refrigerator when cleaning, you allow it to come to normal temperature while allowing the contaminants to come out of the comfort zone which allows better cleaning. Removable parts could be the shelves, the side storage spaces, the vegetable box and any other additional parts that are hosted in the refrigerator. While that is some, it becomes easy for you to clean the nooks and crannies while ensuring clean interiors all through. Making use of soapy water to clean the fridge makes it easy for you to get rid of caked dirt from food spills or any other source. When you clean the refrigerator, and it takes a lot of time for you to do so, the cold temperature of the fridge increases to the room temperature. Once you are done with the cleaning, put back all the parts in place and switch it on. After an hour or so, you could check whether the temperature has been set inside or not. While this is done, the foods get to receive that protection faster when compared to putting it in right after it has been cleaned. That way there is lesser pressure on the compressor and thus leading to better longevity.